Two foxes; a brace of pheasants; one green woodpecker and one grey heron; 300 seagulls; two jays; a family of rabbits. What reads like a recipe for some gluttonous medieval feast is actually the wildlife I glimpsed on a recent train journey from Brighton to Bristol. Window gazing is a simple pleasure for the regular train traveller. It’s a reward for taking the (sometimes) slower option; not something that appeals to most car drivers, who consider speed the only relevant aspect of a journey, and the wildlife spotted is generally of the pancaked variety. But for train lovers* like me it’s the perfect embodiment of that travel writer cliché: the journey is part of the fun. The train trundled along the Sussex coast, through Hampshire, then the gentle levels of Dorset and Wiltshire – my childhood stomping ground and just as green and inviting as I remembered it. Onwards to Bristol, baking in the unusually fierce April sunshine, to meet an old friend for a long-overdue walk. 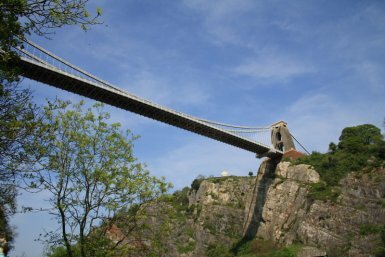 Bristol is the UK’s ninth biggest city, but the Avon Gorge cuts off the western side of the city sharply, preventing any urban sprawl. The result is some very pleasant countryside just a short bus ride from the heart of the city. We headed for Pill, a small village on the western bank of the Avon. The riverside path is not the tranquil bliss of 18th century poems, but it is interesting to see the ports and factories on the opposite side of the river – a reminder of how vital these networks once were (and still are in places) to Britain’s trade and industry. 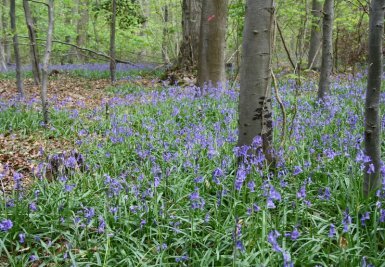 And the tranquillity was not long in coming – Leigh Woods, owned by the National Trust, was the perfect springtime woodland experience, awash with bluebells and wild garlic (and families enjoying the Easter holidays). We ambled around the waymarked paths, the wildlife this time heard and not seen among the thick canopy above. We returned to Bristol via the world-famous Clifton suspension bridge. It dominates the surroundings and the ingenuity behind it is well documented elsewhere, but on the city-side we found an information board detailing an unknown (to us) side of Isambard Kingdom Brunel. During construction of the bridge, the wife of a construction worker realised that several rare plants would be destroyed by the bridge, including Bristol rock cress and autumn squill (no idea either – Google it). Brunel relocated the plants further along Clifton Gorge so that they wouldn’t be destroyed. Take note, modern day planners. So great engineer, pioneering conservationist and a crazy name to boot. What a guy. * train lover does not mean trainspotter. A key difference.